It’s hard to believe I haven’t made a post since Wednesday. Yet, I know too that I have had incredibly busy days. Also, bad news. Another death in my family, on my son-in-law’s side. So sad, so unexpected. I think I’ve had enough death and other bad things happen this past year. We are all crushed. My programs at Ranger, Texas High School (Civil War Program) and at Dublin (Scots-Irish Program) Intermediate School were so much fun. The teachers were gracious, and the students were vibrant, funny, respectful and eager to learn. 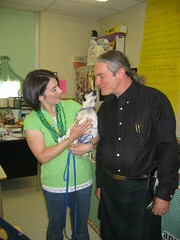 I’ll have more photos, but here is a photo of one of the teachers, Julie, and her little dog who came to class also, Presley Irish, who was also celebrating St. Patrick’s Day with us. Friday night, I had a book signing at Hastings Bookstore in Stephenville. It was another near sell-out. 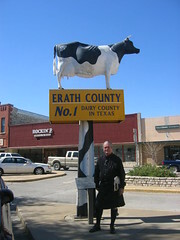 As you can see below, in the town of Stephenville, I also had my photo taken under Moola the Cow. This is big dairy country. (Stephenville is the home of Jewel and Ty Murray. Remember Jewel did a song of Stephenville). I also marched with the local SCV groups in the morning parade. I’ll post some photos of them soon. After the parade, I changed into my kilt, drove to the city park where the the festival was, and set up my table for the festival. Sales were brisk and I met so many cool people. 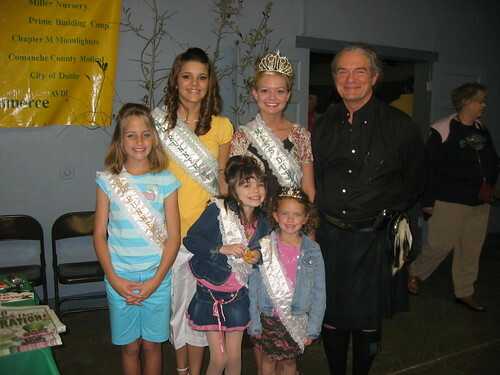 Below are some photos: Me with the local bank’s leprechaun, me with some of the Miss (and Little Miss) Dublin Queens. I was given their names by height. Included here (by size I think according to the list I was given) are Camry Porter, Kayla Tamez, Sydney Beck, Taylor Templeton (Miss Dublin) and Kylan Spurger. So hey, why not follow me, the blond bombshell deity? *After this trip, I realize how much I love (and miss) West Texas. I’ll have much more to post on this trip later.